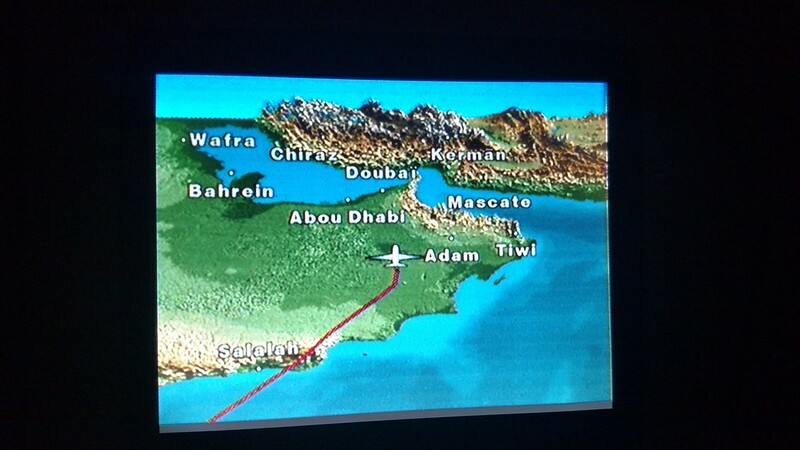 When I was planning my Around-the-World itinerary, it was always easy coming up with potential destinations; the tricky part was always trying to find a way to connect those dots. Especially as Africa, specifically South Africa, was considered a must on my list. So how do you leave South Africa to go to other African or non-Africa destinations? 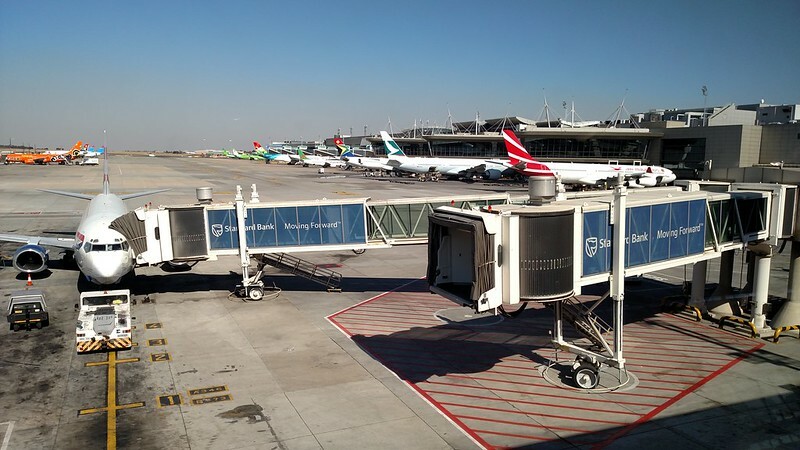 The first through to most US-based SkyTeam fliers would be to fly via Europe perhaps on KLM or Air France, both of which maintain a large number of African destinations and have large global networks. Thankfully though, that isn’t required! 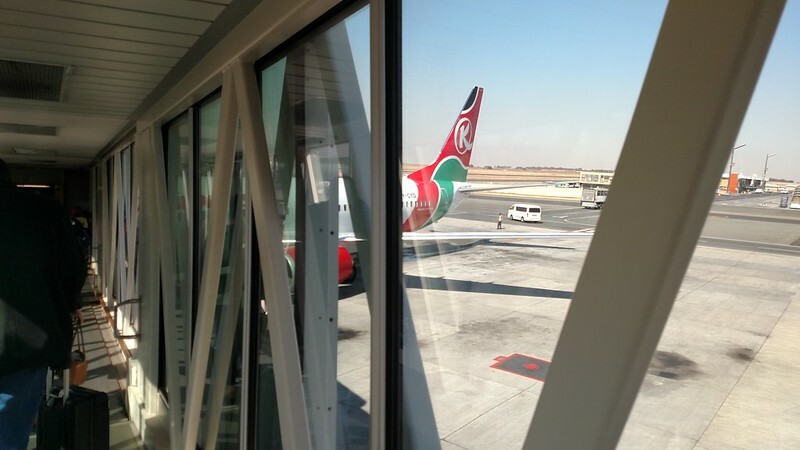 Kenya Airways, which joined SkyTeam back in 2010, offers a very convenient hub in Nairobi, Kenya with flights to more than just destinations in Africa. There are flights between Nairobi and Europe, Asia, and the Middle East and is constantly growing, adding many new aircraft and routes. Availability on Kenya Airways was very good when I was looking for my itinerary. 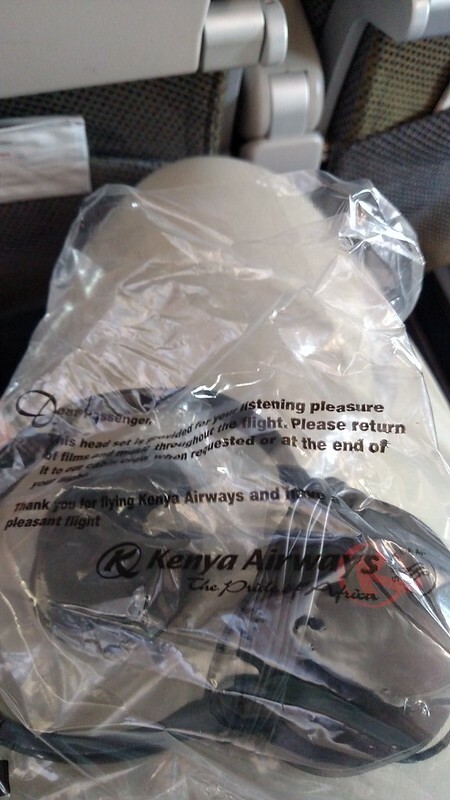 For each of the six legs I flew with Kenya Airways, I was able to find award seats on the days that I wanted using various tools out there, as Delta.com does not offer flights on Kenya Airways for award searches. For this leg specifically, I was able to choose an option with a long layover in Nairobi versus a relatively short one. 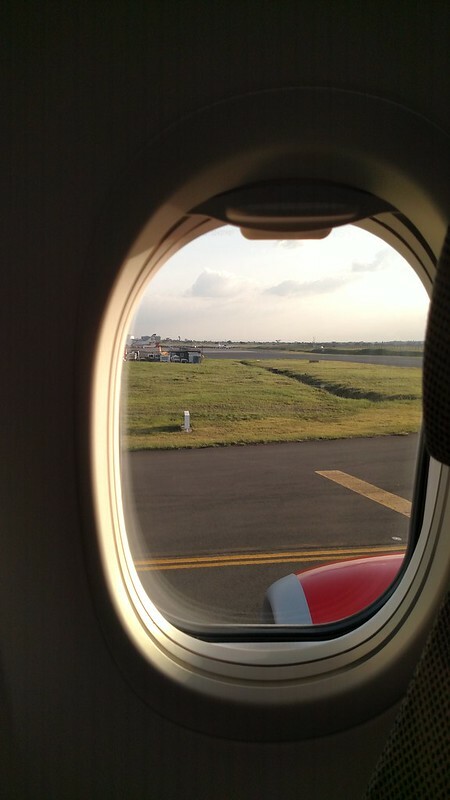 Considering that I would have needed a visa to enter Kenya, I didn’t see too much of a reason to schedule the longer layover to barely see anything in a short amount of time or just to wind up spending more time in the airport. 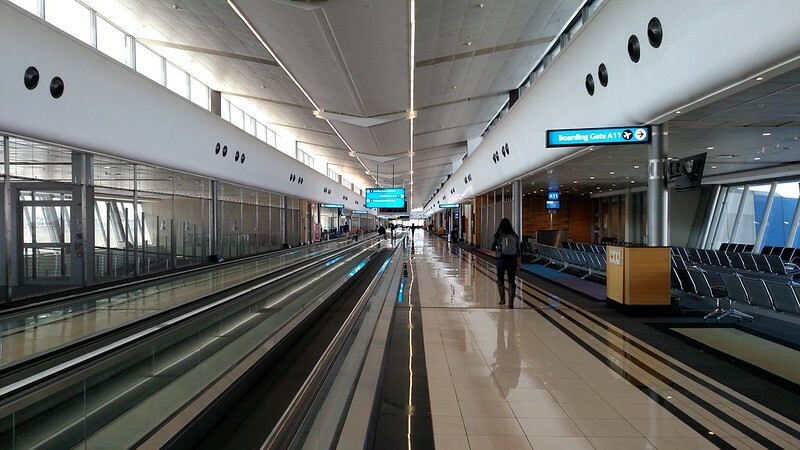 After being dropped off by the shuttle from the Protea Hotel OR Tambo Airport, I made my way into the terminal to try to find my way to the Kenya Airways counter. 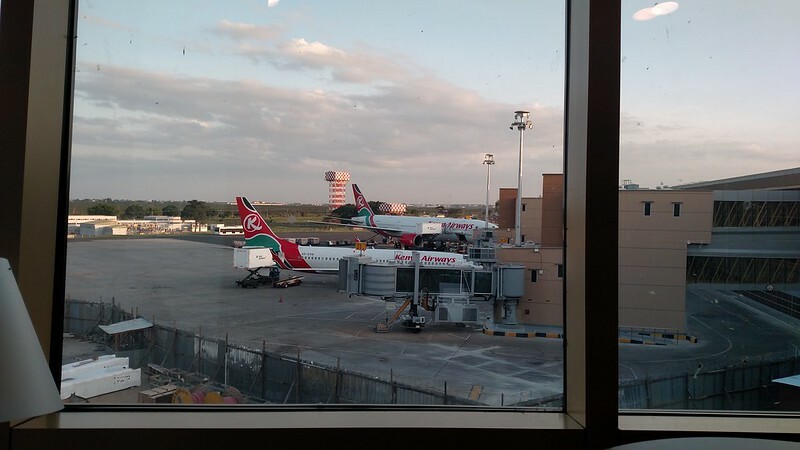 I made my way through Terminal A, and low and behold the Kenya Airways counter was practically the opposite end of where I was dropped off, or at least it felt that way carrying my bag around! 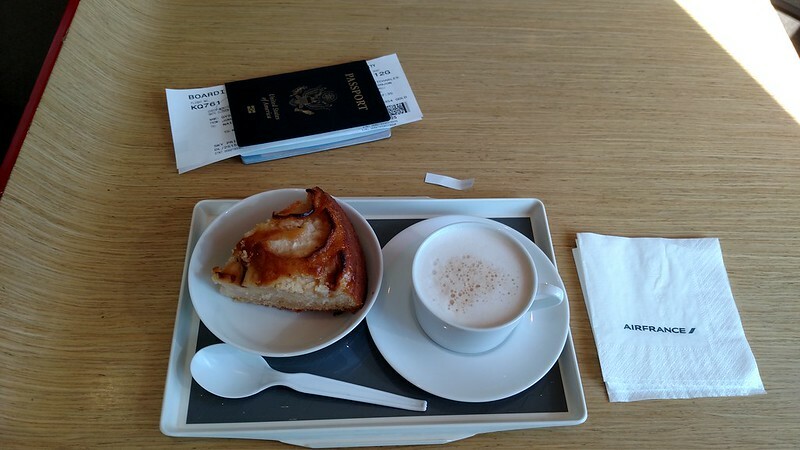 They had a SkyPriority lane available, so I made use of that, however the counter wasn’t busy at all. 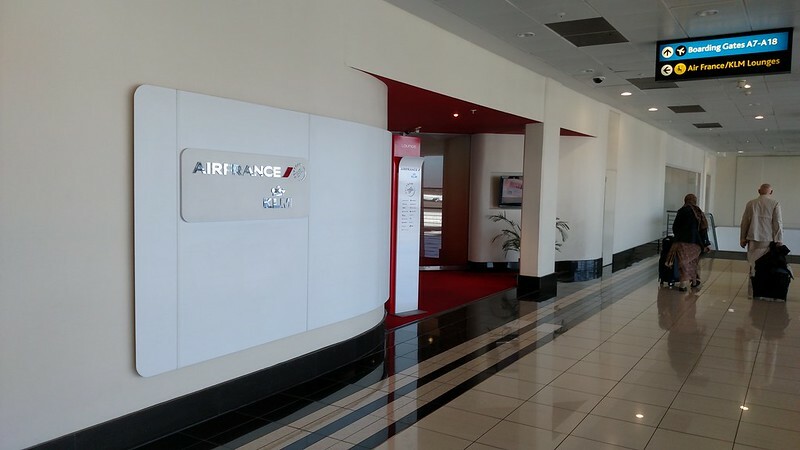 It didn’t take long to get my bag checked, boarding pass issued, and a lounge invitation for the Air France-KLM Lounge. Immigration and security checks were pretty painless and I was through much quicker than I had anticipated. With several hours to kill, I checked out a few shops, trying to find a way to burn the last little bit of Rand in my pocket. I didn’t see anything too particular, so after awhile, I just went to the lounge. 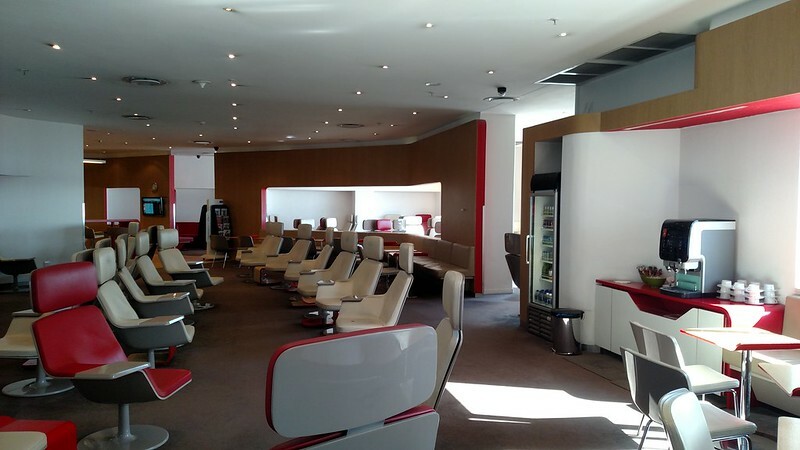 In Johannesburg, Kenya Airways makes use of the Air France-KLM Lounge. 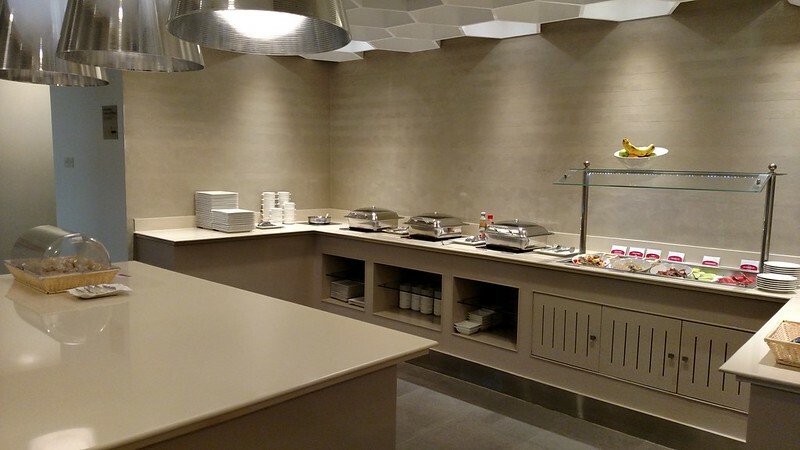 I was given an invitation based on being SkyTeam Elite Plus (Delta Gold Medallion), and it happens to also be the only lounge available for SkyTeam fliers that I am aware of in Johannesburg. Upon entering, I handed over my invite at the reception and made my way into the lounge to find a chair. I don’t know why I was expecting it to be busier, but this lounge was empty! Ok, so there was maybe 2 other people in here who weren’t lounge staff, but if I hadn’t walked around I probably never would have seen them. There was a limited food spread out this morning, not quite as good as what I found in the SLOW Lounge, but wasn’t the worst I had seen. 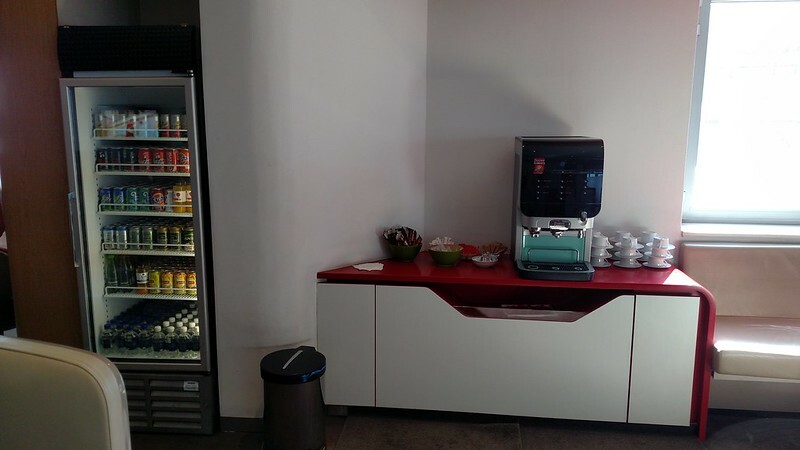 Additionally, they have multiple drink stations throughout the lounge for both hot and cold beverages, although I think all the liquors were at the bar/food area. Obviously, it being still the morning, I was after coffee, not beer. About 30 minutes before boarding was scheduled to begin, I decided to make my way to the gate, if anything to just stretch my legs. It didn’t take long to reach the concourse, which also was fairly quiet. I guess that these gates must be used for longer-haul international flights, which obviously aren’t going to be in the middle of the day. Actually much like Atlanta’s Concourses E and F during the same period of the day, only a handful of flights makes it relatively quiet. With time to kill, I walked up and down the concourse, getting a few glimpses out the windows, at one point spotting three A380s parked next to each other. Besides that, I finally found away to spend all by 40 Rand in my pocket and bought a little souvenir before heading to the gate for my flight. Judging by the number of people in the gate area, this wasn’t going to be a very full flight. Which is also why boarding probably didn’t quite start on time either. They didn’t really make use of SkyPriority for boarding either, but then again, it wasn’t a super full flight and I wasn’t going to be in Business Class, so I wasn’t really concerned. Today’s flight would be operated by what must have been a quite rather new Boeing 737-800. The inside was very clean and bright, and featured the new large-screen IFE system that Delta and many other airlines are installing these days. 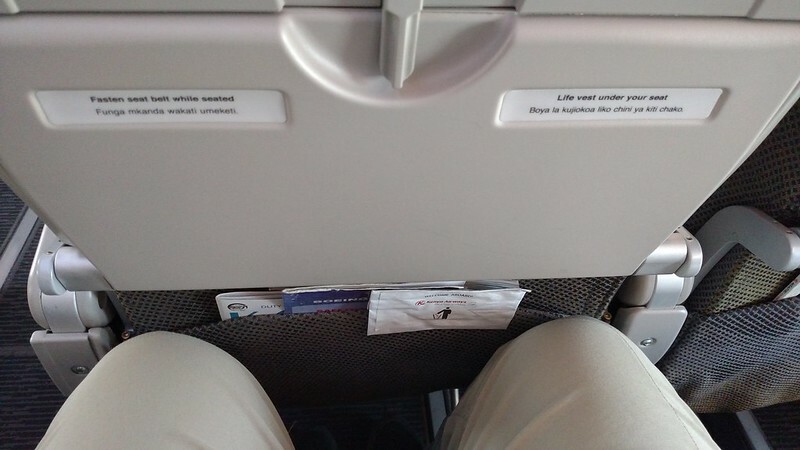 I settled into my seat, an aisle, and very quickly realized that I would not have any company for the flight. A slight win for sure! Being able to spread out across the row and have easy access to both the window and aisle for the flight is always a win when in Economy Class! On the legroom front, that helped out a little bit, as while Kenya Airways doesn’t have the worst legroom that I’ve encountered, it isn’t exactly the best either. I should also mention that they provide headsets to all the passengers, however you can equally use your own as well. 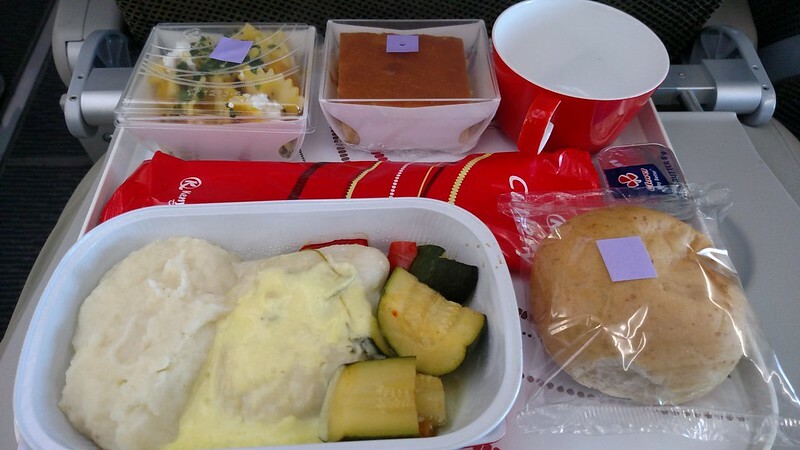 Shortly thereafter, the flight attendants began coming through the cabin to start the meal service. Starting out with drinks and a snack (nuts), they came through the cabin. Following this, was the main meal service which consisted of two hot options. Up for offer was beef or fish. 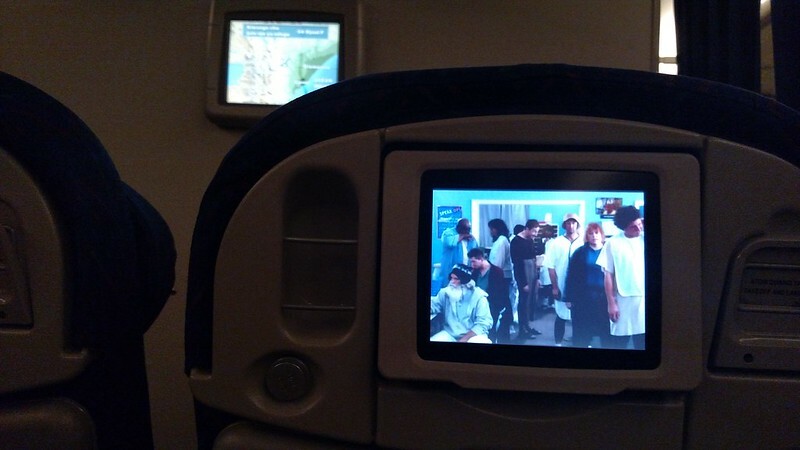 Throughout the flight I primarily sat there and enjoyed a few movies whilst sitting back and relaxing. 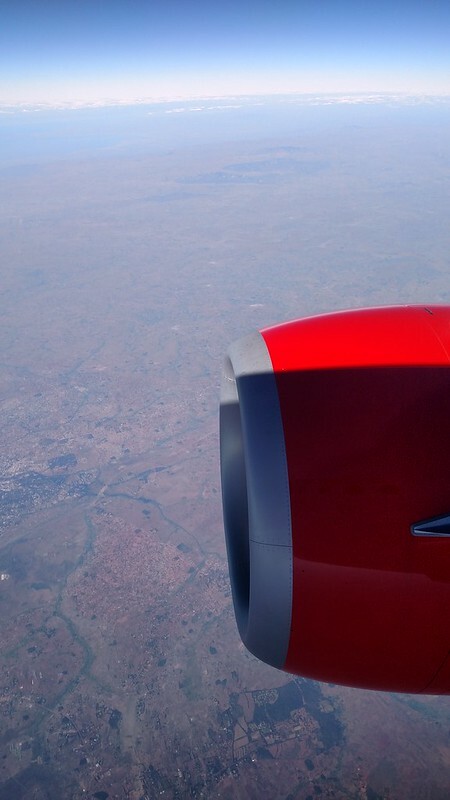 I also spent a good deal of time just looking out the window and enjoying the view of Africa below. At one point we got an exceptional view of Mt. 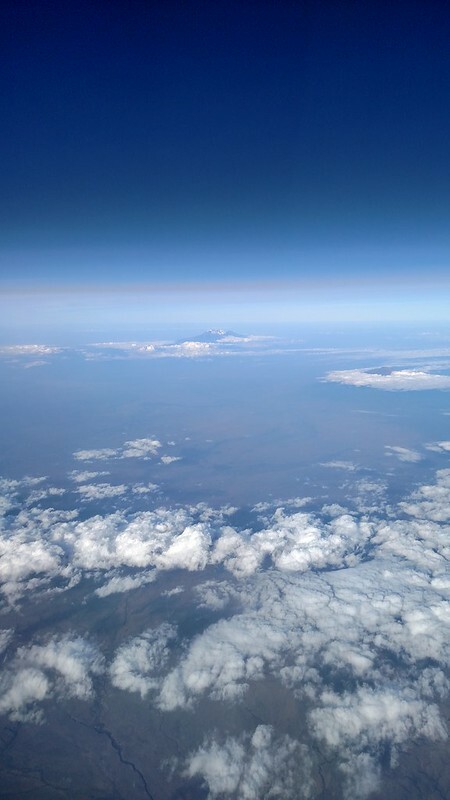 Kilimanjaro, passing it as we started the turn towards Nairobi. It wasn’t long after passing the mountain before we were landing in Nairobi for an on-time arrival. A couple of years ago there was a fire that ravaged the terminal at Nairobi’s Jomo Kenyatta International Airport. 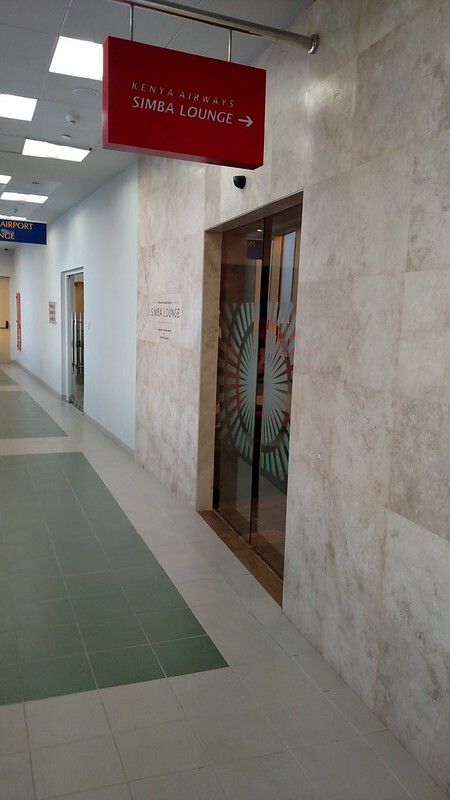 As a result, they have been extensively rebuilding while also modernizing the terminal, which also creates situations where there aren’t enough gates available for all the aircraft. 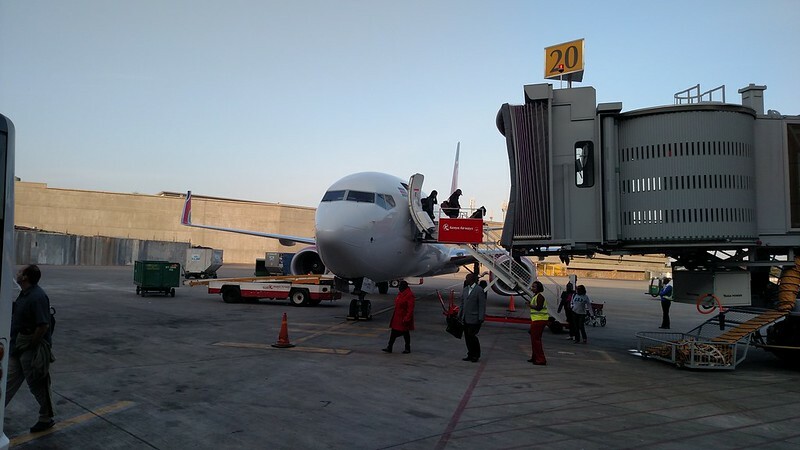 Even for flights that pull up to a gate, it doesn’t necessarily mean that you’ll use the jet bridge. In my case we pulled up to the gate, but deplaned via stairs and taken by bus to a terminal entrance. Being on the first bus, I was able to make it to the transfer level quickly and with no lines made it through security very quick. They did have a SkyPriority line for the transfer security check, however as it wasn’t very busy at that time, so it wasn’t very necessary. 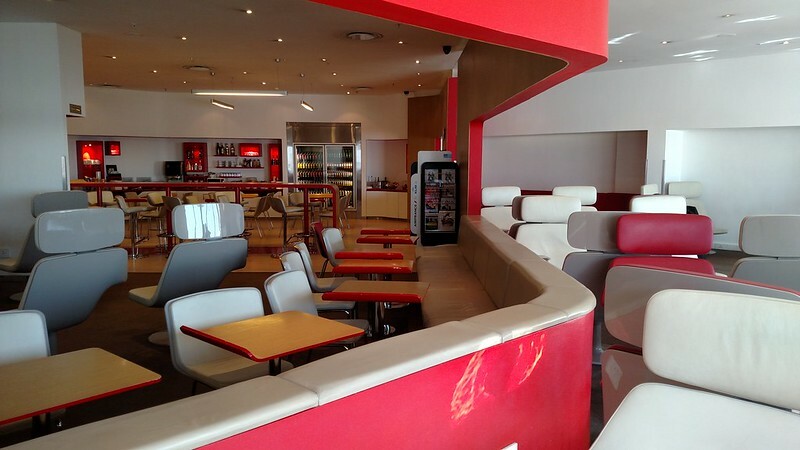 My layover wasn’t going to be a very long one, based on the boarding time indicated on my boarding pass, so I opted to hit the first lounge I came across, the Kenya Airways Simba Lounge which was on the second level right after clearing security. After checking in with the lounge agent, who reconfirmed my gate, I headed for a chair up next by the window. It’s not a very large lounge, or at least from what I could see, but since I didn’t have much time…well having a beer and a quick snack was a higher priority. 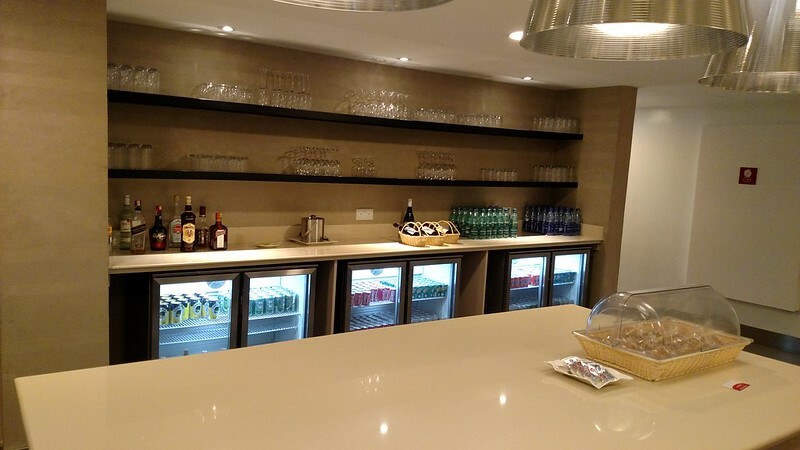 The Simba Lounge had a both hot and cold food offerings, although it wasn’t a wide selection. I’ll chalk it up to being a fairly small lounge as to why there wasn’t much available. That being said, I tried a few things quickly before turning back around to head towards the gate for my flight to Dubai. 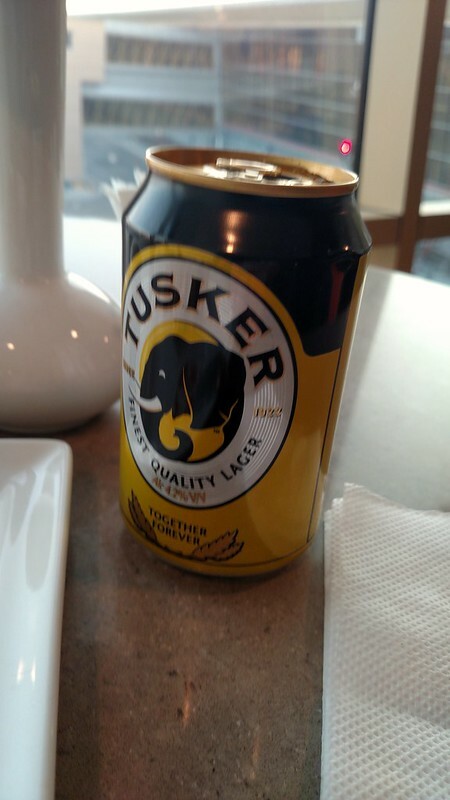 Had I known how the gate areas were in Nairobi, I probably would have stayed in the lounge longer. Much like Amsterdam, each gate area is an individual holding area where they scan your boarding pass when entering. Unlike Amsterdam though, since you clear security there isn’t a security check at the gate. However, just like Amsterdam, once you are in the gate area you are pretty much stuck in there. Sure, there’s a restroom, a few TVs, and I think a vending machine along with the chairs. It’s very boring and a rather terrible place to spend time when I could have been relaxing in the lounge. In fact after 20-30 minutes of being in the gate area (and already pass the published boarding time), I started to see a few passengers from the lounge start to come in. As one might expect, boarding was a bit chaotic. I think the only way I was able to board when SkyPriority was called was due to the fact that I had positioned myself near the door to the jetway. Once they announced boarding was about to begin, everyone swarmed towards the door. 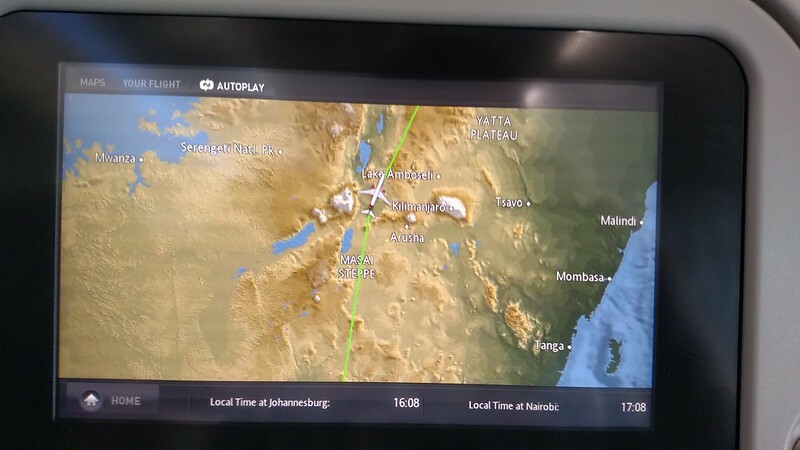 Once onboard, I made my way to my seat fairly quickly as I in the center of row 12, which is the second row of Economy on the Kenya Airways 777. You could tell this plane was a little bit dated when it came to the interiors. Almost thought I was having a flashback to an Air France flight I had taken ten years prior. 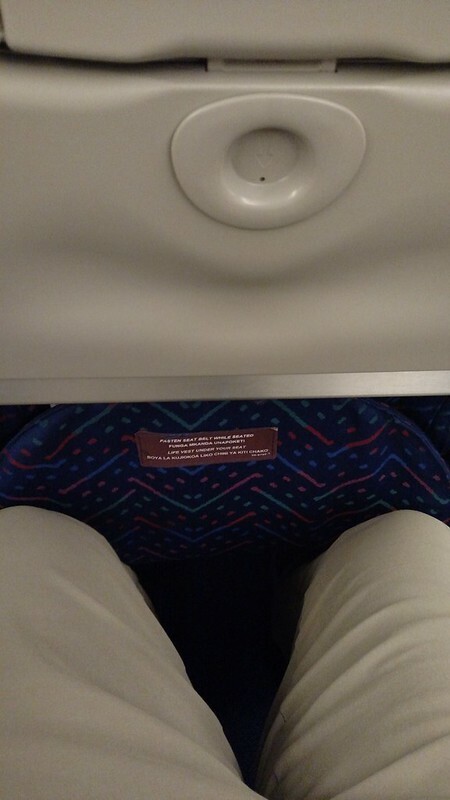 Legroom, was well, tighter than on the 737 that I flew in to NBO on. And the IFE, it had a decent selection, but the system was an older one that was a little bit slow at times and featured a much smaller screen. 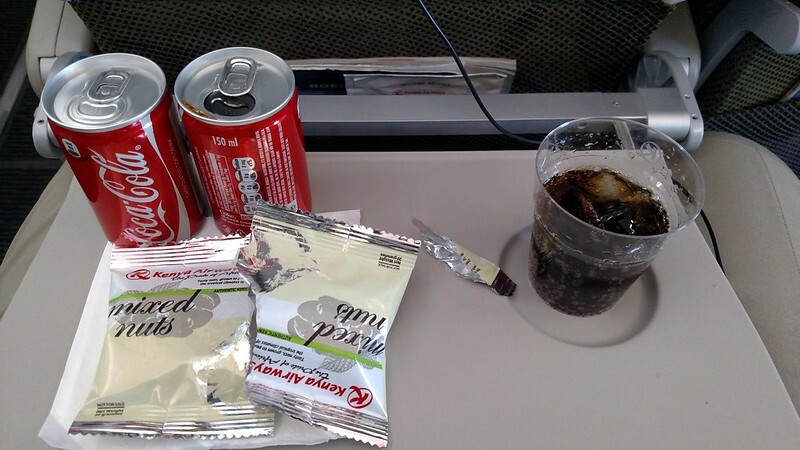 About an hour or so into the flight, the meal service began. The dinner option I had decided to go with was lamb with rice and vegetables. 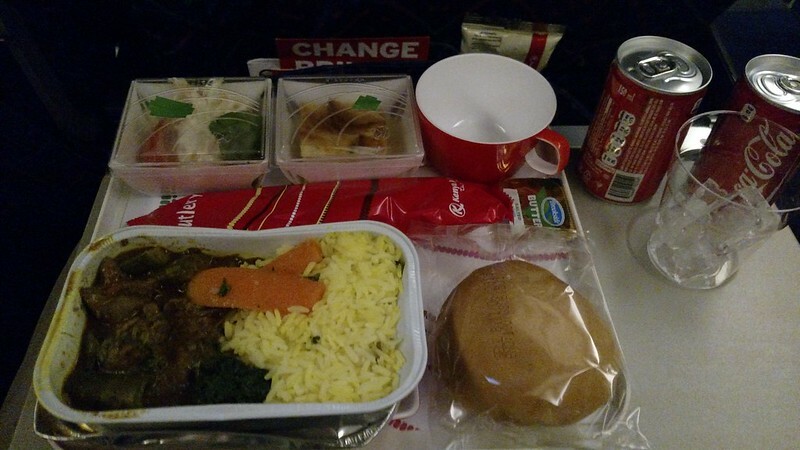 It was a pretty average economy class meal, and at the very least it wasn’t mystery fish. The rest of the flight was fairly non-eventful. I kept switching between various movies, TV shows, and airshow. I didn’t even try to get a little bit of sleep, as I knew I would want to make sure I could pass out without any issue once I got to my hotel that night. After pulling out a few Dirhams from an ATM, I decided with it being already past 2AM that I would just get a taxi to the hotel. Thankfully, Dubai has a decently looked after airport taxi stand and you can choose between a regular cab or a black car. I didn’t see the need to pay any extra, and the attendants were able to relay to the driver my hotel. Considering I was pretty well tired, all of this definitely made it easy. Of course I could have tried to use Uber as well, but you really never know how pickup at airports can work out. Plus without a local SIM in hand, I didn’t have a way for the driver to get in touch with me anyways. 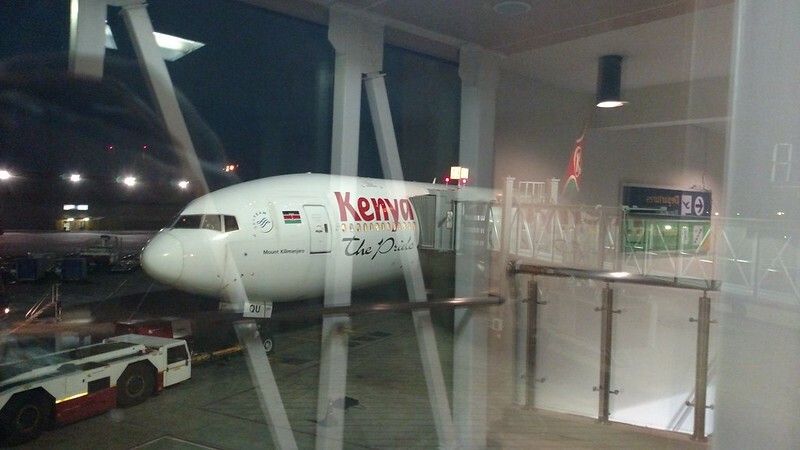 This entry was posted in Africa, Kenya Airways, RTW, Travel, Trip Report. Bookmark the permalink. Follow any comments here with the RSS feed for this post. Post a comment or leave a trackback: Trackback URL.